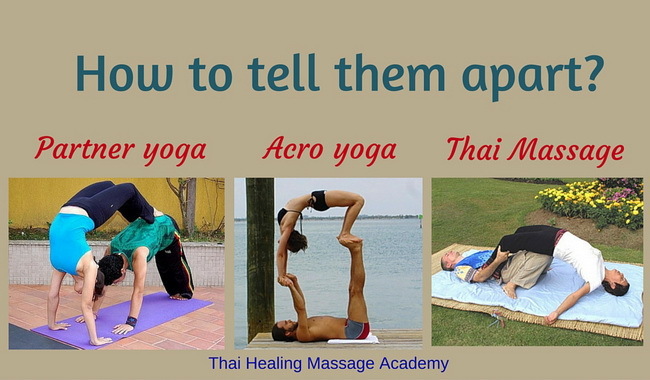 Thai Massage versus Thai Yoga Massage – what’s in a name? Thai Yoga Massage is basically another name for Thai Massage. There are variations and adaptations and different styles of therapists, but we are talking about the same family of bodywork. The term ‘Thai Yoga Massage‘ has been coined by western practitioners. It is quite an appropriate name since it does reflect the fact that Thai Massage has its roots in the yoga tradition of India. Continue reading…Thai Yoga Massage Versus Yoga – Which One Is Better? Thai Yoga Massage shares quite a few common elements with yoga and acro yoga. This is sometimes called “flying yoga” since the passive partner is being moved around while “flying” on the feet and hands of the active partner who is lying on the back. Many practitioners came up with very creative and sometimes amazing adaptations. “Flying yoga” is beautiful to watch and a powerful experience when you receive it. Recently one of those talented therapists, Lorenzo Becchi, visited us at the studio of Thai Healing Massage Academy. We shot a video of him performing his graceful and mindful “flying massage” system. Many of his moves are similar to Thai Massage techniques, but they are all done in flying mode with the receiver in the air instead of lying on a mat. Lorenzo’s style looks like a combination of Thai Massage and yoga, but done in the air so that the client experiences a feeling of weightlessness. It is similar to Acro yoga, but with Lorenzo’s very special and unique touch. You really need to see it to appreciate it. What is the Difference Between Thai Massage and Partner Yoga? 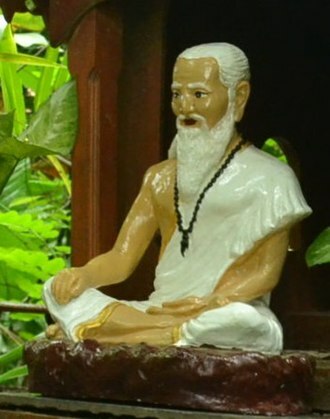 Thai Massage has its roots in India’s yoga tradition. According to legend, about 2,500 years ago, during the time of Buddha, an Indian physician came to Thailand and brought what is now known as Thai Massage with him. The similarities between the two systems are quite obvious. Thai Massage is often called “Thai yoga massage” or “lazy man’s yoga” since it is somewhat like yoga being done to you. The therapist is applying a series of yoga-like stretches to the client. Normally yoga is done by individual practitioners who perform stretching techniques on themselves. But there are also styles where two yoga practitioners work together. Continue reading…What is the Difference Between Thai Massage and Partner Yoga?